Since 30th March 2018, every Friday Palestinians protest against the blockade on Gaza. Commemorating the Great March of Return, protesters demand their return to territories occupied by Israel. In response, Israeli Occupation forces have repeatedly used excessive and lethal force against protestors. Today, the 19th October 2018 is no different. This week's protest looks even more dangerous, with reports of Israeli tanks lining up in preparation for protesters at the border. Every Friday since 30th March 2018, Palestinians have protested against the blockade on Gaza. Commemorating the Great March of Return, protesters are demanding they be allowed to return to territories currently occupied by Israel. In response, Israeli Occupation forces have repeatedly used excessive and lethal force against the protestors. As previously covered on the CIVICUS Monitor, civilians have overwhelmingly paid the highest price as a result of this use of force. Throughout 2018, children, paramedics and journalists have been targeted with live ammunition by Israeli forces. "There are serious fears that this policy will further sanction the use of deadly force against unarmed protesters during today’s demonstrations, and that Israeli forces will be given carte blanche authorisation to carry out large-scale, unlawful killings escalating the bloodshed. Israel has repeatedly used lethal force unnecessarily and excessively against unarmed protesters in shameless violation of international law." In a recent statement, the UN Special Rapporteur the situation of human rights in the Palestinian Territory occupied since 1967, Michael Lynk, decried the use of lethal force. Lynk noted that many of those targeted by Israeli forces posed no imminent threat. As such, the use of lethal force was a disproportionate and intentional violation of human rights. Only last week on 12th October 2018, the Palestinian Center For Human Rights documented the killing of seven Palestinian civilians by Israeli security forces. A child was among those killed in the clashes. The CSO described the heavy Israeli presence and the flagrant use of tear gas and live ammunition to control Palestinian crowds. During the protest, 224 others were wounded, including 42 children, 3 women, 3 journalists, and a paramedic. With our local partners, the CIVICUS Monitor will continue to monitor the situation in Palestine. 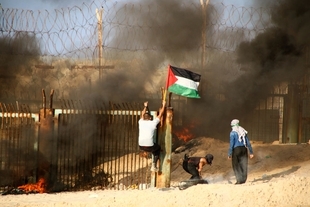 #Israel send the tanks very close to the fence with the #GazaStrip.